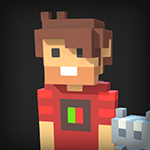 Cubik Studio can export a voxel model to "SCHEMATIC" format, commonly used for Minecraft maps. Click Apply and start creating your voxel model! Go in your model properties "Model" > "Settings" > "Minecraft"
You can also click "Auto list" so Cubik will take all colors in your voxel model and add it to the list. If a color is recognized, it will be automatically associated to right block. Yes the bug is known (currently it can only export 16x or lower resolution) and the exporter is fixed for next release. Any plans to expand that 16x size? Do you know any programs that converts 3d models with texture to .schematic? If you export schematic, the file is corrupted. It is also possible to send it at 16x resolution. The error contents are as follows. is. please answer about my question. I've followed these steps and mcedit cannot read the file because it produces a schematic which is 0 bytes. And i can't see how i can change my "Number of voxels per axis per zone" to below 112. Could you please let me know how to resolve this? I bought a license for Cubik Studio to convert VOX files (produced by magicavoxel) into .schematic files for import into minecraft worlds. Thanks in advance. I have a problem with materials. When I export a model and then try to import it via worldedit it says "Schematic file is missing a "Materials" tag"
When I go to Model properties and Map options, all the materials are assigned correctly.